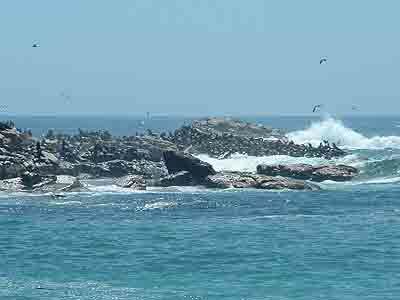 Seal Island situated at the northern end of False Bay is home to one of the largest colonies of Cape Fur seals in the Western Cape. The island lies about six kilometres off shore and is a large granite rock approximately two hectares in size. It has no beaches and it is difficult to land on especially when the sea is rough. During World War II a radio antennae was built on the island but it was blown over during a storm in 1970 and now lies on the island in a twisted heap of scrap metal. In years gone by the island was home to many species of sea birds but gradually as the seal colony has grown the birds have left. While the birds still lived on the island guano collectors visited the island on a regular basis to scrape guano off the rock to be used transported to the mainland to be used in the fertilizer industry. During this period many of the sea birds left the island as a direct result of having their nests destroyed when the guano was collected. Although there are still 80 pairs of breeding African penguins on the island the main inhabitants are a colony of 75000 + Cape Fur seals who live and breed there. Breeding is unimpeded as seal hunters are no longer allowed to visit the island and kill them for their pelts. Having a large seal population in False Bay also means that their natural enemies the great white sharks are also in abundance in False Bay. The great whites however do not stay in close proximity to the island but swim the length and breadth of False Bay hunting as they go. As surfers look like seals from underwater the sharks mistake them for seals and attack them. So far the attacks have caused one fatality and have left a number of people maimed. The seals on Seal Island are fully aware of the sharks and the danger that they hold so they have developed a number of safety tactics to protect themselves when leaving the island and while they are in the water feeding. When departing the island to feed a number of groups of seals (with each group consisting of between eight and twelve seals) dive into the water together and swim away from the island. To protect themselves once in the water the seals have a number of tactics they use. In order to avoid an attack from the deep the seals swim with their heads pointing downwards and only their tails and the tip of their rear flippers showing above the water. This tactic is called the head down posture. If an individual seal is being hunted by a shark the seal will try to get above the shark as close to its dorsal fin as possible where the shark is unable to reach it. This tactic is called �on the shark�. Another tactic used by the seals when approaching the island to land is to swim the last 50 metres underwater which presumably reduces the vulnerability to attack by the Great White Sharks. The tactics used are however not foolproof and every now and again a seal is caught by a shark. When this happens there is great consternation amongst the seals who appear to be stunned, just as humans would be after a shark attack. Cape Fur seals have officially become known as South African fur seals and are so-named as they have thick pelts, unlike true seals which have only a thin covering of hair. In countries in the northern hemisphere seals were hunted for their meat and pelts but this was not the case in South Africa. It was only for their pelts that the young fur seals were hunted. Since 1990 however, there has been a ban on seal hunting and the colonies of seals are increasing in number more or less unhindered. When hunted seal pups were slaughtered for their jet black pelts and the olive grey coat which they acquired after moulting. Fortunately the killing of the seals and the use of their pelts became a contentious issue with conservationists as the method of hunting and killing the pups was extremely gory. The young seals were clubbed with a heavy club on the head and then had cut their throats with large knives leaving them to bleed to death if they had not been killed by the initial clubbing. Adult males were also hunted for their genitalia which were collected and sold as aphrodisiacs in the Far East. Today, left alone to live in peace, the males grow to about two metres in length and weigh between two hundred and three hundred kilograms, while the females are much smaller, weighing in at between fifty and seventy five kilograms and measuring about 1.5 metres in length. 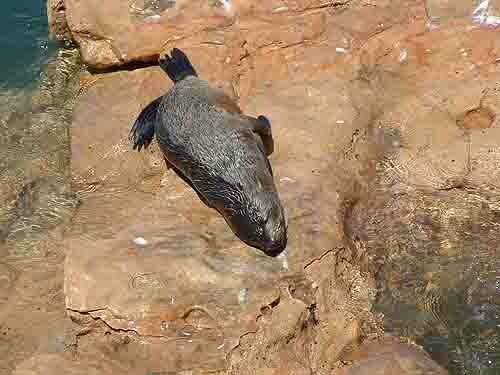 The habitat of the South African fur seals is restricted to islands and the mainland coastlines between northern Namibia and Algoa Bay where the rich fishing grounds are located. During the breeding season chaos ensues in the breeding grounds as the fiercely territorial males protect their females from other marauding males. When females give birth it is normally to a single pup, with most of the pups being born over a period of about six weeks starting in mid November and ending in late December. On the mainland the pups are often killed and eaten by blackbacked jackals and brown hyenas. One of the few natural predators of land based seals. Although seal hunting has been stopped seals often fall prey to fishermen. As carnivores seals have a varied diet which includes pilchards, anchovies, horse mackerel, hake, snoek, squid, and the occasional rock lobster. They are therefore in direct competition with fishermen and sometimes are shot and killed by them when they steal their catch or land up in their nets. Seals are however inquisitive and friendly when in the water and will often swim around divers for periods of several minutes at a time. On land they are far less relaxed and tend to panic when people come near them. The Western Cape has a number of colonies of seals which can be visited. Seal Island in False Bay is one of the places to see the seals although people normally go there to see the sharks which are attracted to the boats by chumming. Duiker Island near Hout Bay has a colony of young males seals and visitors can take a short boat trip from Hout Bay harbour to go and see them. Another place to see seals which is easily accessible is the V & A Waterfront where a number of seals come ashore and sleep on steps leading up to the various quays around the harbour. One place in the waterfront is near the Nelson Mandela Gateway to Robben Island where you will always find at least one sleeping seal. Cape Town is a prime holiday destination.